The Buteyko breathing technique was a method of breath retraining that was created by Konstatin Buteyko in Russia. He noticed that his patients who were nearing death all have very shallow breathing and many of them were breathing in and out of their mouth. He drew a correlation between breathing and health. While I don’t support the assumption that all health issues are due to improper breathing techniques, there is a strong correlation between illness and incorrect breathing. I have noticed it myself as I worked in Special Education in the public schools. Students who were in gifted classes often were naturally breathing through their nose. The majority of them had better posture than the other students in the building. The students who were in the intellectually disabled classrooms were often slumped over and breathing through their mouths. The Buteyko Breathing method is an array of simple techniques which offer a simple, time tested and natural cure for a variety of breathing problems and health issues. Bronchospasm, or a sudden muscular constriction in the bronchioles’ wall, is caused by insufficient CO2 levels in the lungs. The Buteyko breathing method helps a patient to normalize this low CO2 level quickly. Once the levels are normalized, the walls of the bronchioles relax. The airways open up when they are relaxed and the patient can then breathe again. This technique is used to counter chronic hyperventilation, which you may not even realize that you have. It focuses on learning easy and relaxed nasal, diaphragmatic breathing. When a person is suffering from an asthma attack or chronic illness, they often have poor breathing mechanics and tend to overbreathe, or breathe too shallowly and quickly. This actually reduces the carbon dioxide in the body. Hypocapnia, or a CO2 deficiency in the lungs is very common among those suffering with a chronic disease. This is due to the prevalence of chronic hyperventilation among sick individuals. Our modern lifestyles have actually led to some chronic hyperventilation. Currently, over ninety percent of modern people are hyperventilators. Therefore, chronic hypocapnia is very common on today’s society. 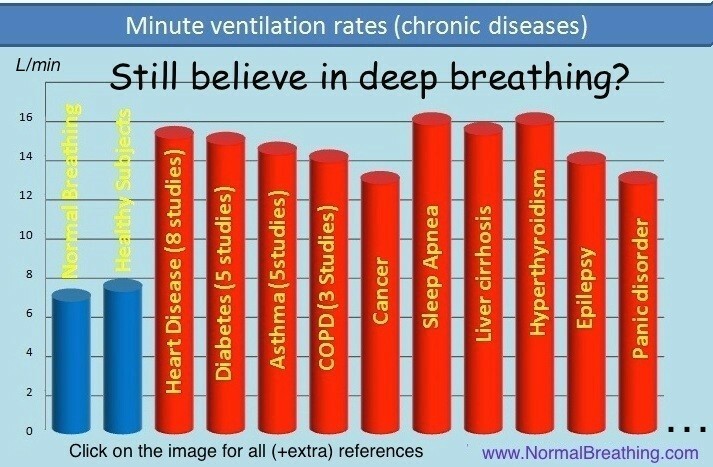 As you can see from the table from Normalbreathing.com, there is a correlation between people who have an illness and the amount of air they are breathing. This is a non-invasive technique that will help to improve your health. You won’t spend money on expensive medication or deal with unnecessary side-effects from the medication. In the long run, it will save you a ton of money on medications. If you currently take a medication from asthma, it is unlikely that you will need to use it as much after 3 weeks of Buteyko breathing exercises. You may eventually be able to come off of it altogether. Eliminating the stess of taking daily medication will improve your overall quality of life. Once you master this technique, it is highly likely that you will be able to eliminate some of the medications from your life altogether. The Buteyko Breathing technique teaches you control, discipline and self-mastery. To learn this technique properly, you must make it a daily practice. You also must learn to listen to your body’s signals. After you’ve properly learned this technique, you can be relaxed even during an asthma attack, rather than relying on faster overbreathing techniques that lead to intensifying symptoms. These techniques will normalize the CO2 level in your lungs. This will influence your metabolic and immune system positively. The Buteyko breathing method assists the body with nerve stabilization due to its calmative effects on the nervous system. A lack of CO2 in the brain can lead to “spontaneous and asynchronous firing of neurons.” This can trigger mental and psychological abnormalities which can range from seizures to panic attacks, sleeping problems, addictions, depression and schizophrenia. Muscle relaxation is one of the benefits of the Buteyko breathing method. The relaxation of muscle cells becomes normal at high CO2 levels. Hypocapnia creates muscular tension, which can lead to poor posture and sometimes aggression. The Buteyko Breathing Method can also lead to a reduction in inflammation. Hypoxia leads to or intensifies inflammation in the body. Hyperventilation tends to increase chronic inflammation. The Buteyko breathing method is not without its drawbacks. In order to learn this method, you need to devote about half an hour to practicing the breathing exercises per day. You also should be dedicating an hour or more to physical exercise in order to obtain optimal health. For some people with a busy schedule, they may prefer medical intervention and popping a pill to the lifestyle changes that Buteyko Breathing requires. Buteyko breathing exercises can not overcome a very poor diet. If you are feeding your body poorly, it will need to utilize extra oxygen to digest that food. You may discover that after eating junk food, your breathing returns to a faster unhealthy pattern. Some people following a zero carbohydrate way of eating have reported that their breath control has gone up to about 3 minutes on that way of eating. These were people who weren’t even practicing the Buteyko breathing method. (Most people who are suffering from a chronic condition can barely hold their breath for 20 seconds without some stress.) This is due to the fact that they aren’t constantly using energy and oxygen to digest their food. Most people who are following a zero carbohydrate way of eating are in a state of ketosis and eat only once or twice per day. This enables the body to take a break from digestion and focus on healing other parts of the body. A ketogenic diet can help to reduce inflammation in the body, which contributes to better overall health. This in turn will have an impact on your ability to slow down your breathing and ensure proper breathing techniques. If you truly want to improve your health and have had limited success with diet or want to get to the next level in fitness, you should check out the Buteyko Breathing method. You can learn it from books, online videos or through a certified Buteyko breathing practitioner. My own experience with Buteyko breathing has been very positive. I eliminated my asthma and learned how to control my seizure threshold with this method. As my breathing improved, I noticed that I had a lot of energy, my skin felt great and my focus was improving. One of the books that I recommend reading to learn more about the Buteyko Breathing Method, is Patrick McKeown’s Close Your Mouth. He discusses how important nasal breathing is for not only the gas exchange, but also proper dental formation. Lean Belly Detox Review – A Healthy way to lose Belly Fat? All these health benefits from a breathing a breathing method I will be giving this a try for sure and thank you for this great information. I never knew breathing could have such a great benefit to health especially for heart disease and diabetes. 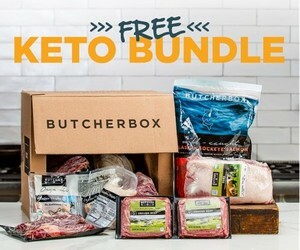 I think a good combination would be a buteyko breathing and a good diet. I agree! The combination of the two leads to optimal health! Many of us haven’t realized the thing how we breath can affect in many ways to our health. In this article, you described that the correlation between illnesses and breathing techniques is obvious. This Buteyko Breathing Technique is very interesting. Tthe right kind of breathing, its learning and maintenance is a major public health benefit that should be invested more all over the world. This article is interesting. I do some yoga and have gone to breathing sessions like Pranayama breathing. It is breathing with intent, deep breathing. I definitely believe that how we breathe can affect our health, I can see immediate effects when I am stressed and intentionally slow down and breathe deeply. I will try to learn more about this Buteyko Breathing. Thanks!